For the first time in more than two years, I was back in one of my favourite places in the world – Canberra. That in itself was enjoyable enough, but there were two other reasons why I was glad to be in the national capital again. One reason was why I was in Canberra for four nights, and which I plan to talk about soon in another post. The other reason was that I could once again visit one of my favourite stores in the world. Shortly before noon I arrived in Civic where I had lunch (for the second of three times that extended weekend) at another favourite Canberra location – King O’Malley’s. 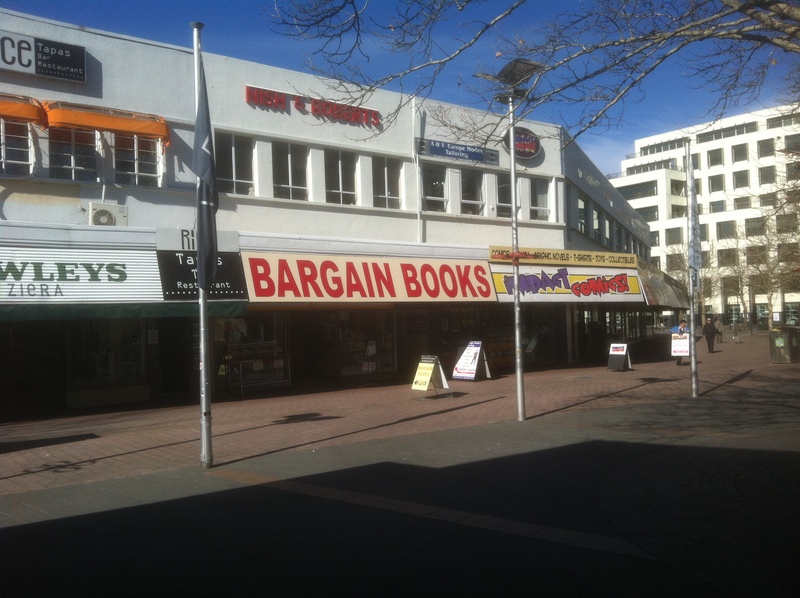 One delicious Mexican King Pizza and jug of diet cola later, I crossed nearby Garema Place (where I’d had that life-changing experience back in early 2009) to the familiar and very welcome sight of Clouston & Hall Booksellers. I went inside, took out my pen and notepad, and went to work. I spent two very enjoyable hours slowly doing a circuit of the entire store, looking at books and listing in my notepad any that appealed to me. There were a few books that I remembered from my 2011 or 2012 visits, and perhaps even my 2009 visits. Some of those books I had bought at Clouston & Hall or Amazon. As always, though, most of the ones I added to my list were intriguing-looking titles I hadn’t seen anywhere else. Finally, I left Clouston & Hall with four pages of book titles that I hoped would mostly be available in ebook format from Amazon. I knew that some wouldn’t be, though, and on Monday when I had to return to Civic to get a Greyhound coach home, I planned to buy a few from Clouston & Hall. As before, I felt a little guilty about my ‘showrooming’, but it wasn’t though any fault of Clouston & Hall themselves – for various reasons, ebooks are my preferred reading format nowadays, and thanks to Clouston & Hall I have obtained and enjoyed works that otherwise I would never have known about. Late that night back at my hotel room, I sat down at my notebook computer and spent an enjoyable hour or so adding most of my Clouston & Hall shopping list to my Amazon wishlist. Fortunately, most of the books on my shopping list were available in ebook format. To my surprise, though, most of them as ebooks were about the same price – or higher – than what they were available for at Clouston & Hall. I did return to Clouston & Hall on Monday morning, just before my trip home to Sydney. Unfortunately, I was limited to what I could buy from there – partly because of very limited space in my suitcases, but mostly because of two unexpected and very frustrating financial factors that reduced what I could buy. Ultimately, I ending up buying just two books. Still, as always, it had been hugely valuable and enjoyable to once again visit Clouston & Hall. And the next time I visit Canberra, which I hope will be much sooner than two years, I hope to go there again. This entry was posted in Action, Bibliophilia, Gratitude, Happiness, Inspiration, Life is Good, Reading, Travel. Bookmark the permalink.